On Sunday, February the 2nd, we were promised a Gala event of Dance at the New Theatre in Newtown. I attended the 7.30pm showing and was happy to be watching the grand finals of Short and Sweet Dance. The 14 presentations of dance talent, mime, inspired choreography, precision timing and often abstract musicality, were engaging, puzzling, humourous, witty, relevant and emotionally connecting. Well done, I say, to all the participants, mentors and organisational and technical support. You pulled off a great night of entertainment and gave the audience food for thought. I enjoyed Joseph Simon’s work in “Familiar Strangers”, as did the audience. He connected with us by using his muscle tone to express an artistic message about Celebrity. “And Then Patterns” was an interesting piece which was well rehearsed. The four dancers, Georgia, George, Ivey and Michael, communicated well with each other in an expressive way, which gave us a well-integrated piece of dance/movement. Jay Bailey and L.C Beats collaborated well in an enjoyable, playful performance about birds. Their beat-boxing provided rhythmic expression of emotion and heartbeat, in some sections, while at other times, there were witty, amusingly clever representations of some of ballet’s more recognisable icons. The audience responded well to the tongue-in-cheek mockery as well as the highly skilled ballet moves. “No Fungus, No Tree” began slowly but subtly and clearly developed to show why Sean Marcus and Anna Healey were worth co-recipients of the Choreography Award at this year’s Gala. Both performances reached an expression of symbiotic movement through rhythm and balance which received much appreciation from the audience. The four dancers of “Nyunga” drew on contemporary ballet skills with an urban edge, which affords an audience a wider perspective. Indigenous dance forms connected with storytelling in an abstract way, rather than a heavily traditional way. The cyclical synchronised moves worked well with the lighting to convey the dancer’s insights and appreciation of all the sun means in our world. Well done to Thomas E.S Kelly and his co-dancers, Taree, Caleena and Phil, for an enjoyable performance. Harrison Hall, winner of the Outstanding Male Dancer Award, certainly showed us how powerful energy can be represented in a concept piece with remarkable skill. His work was unique, yet referenced modern forms, as he communicated his ideas on light, shadow and darkness in a precision piece. He took over the theatre space in a controlled representation, conveyed by muscle tension, arm movement, lighting and a clown costume. The audience too, were gripped in the tension he created; a formidable talent was exhibited here. “Sink or Swim” was a fun piece to end the first half of the program. There were four mermaids who became a dance chorus line and, a young woman involved in a cathartic display. This amused the sometimes stunned and often confused audience. Many people appreciated the dramatic mime techniques and hilarity acted out. This piece showed creative and innovative uses of props and costuming. “Girl Getting Bitter” won Eva Crainean, the Audacious Prize at this year’s Gala. The cast members, Georgina, Kate, Hannah and Aris, presented a not-so-sweet female fantasy, which explored revenge against the male. The worked reminded me of cabaret and burlesque, a theme conveyed to me through the costuming, lighting, feathers and sexually explicit content presented onstage. Amber McCartney was co-winner of the Outstanding Female Dancer Award with her choreographed performance of “Hard-Boiled Wonderland”. Amber is an accomplished dancer who represented intense angular forms to convey “the hidden language of bones” (as per her synopsis). Her skill was contained and controlled, yet insightful and personal. Her dance connected with the audience, who registered respectful admiration for her unique performance. “Salt”; a clever, abstract concept piece co-won Brianna Kell and Alexandra Andrews the Choreography Award. This piece was non-gendered in presentation, where expressive hands connected movements. A progressive exploration of salt was conveyed through the use of evocative costume and fluid movement which Kell and Andrews own the space. They did this through the atmosphere they artistically created. “Out of No Thing” was interesting in that body paint and non-gendered costumed, conveyed an opportunity for dancers Robert, Jayde, Kathleen, Paul and Harrison, to explore space and movement. They did this individually and through various groupings. My response was to engage with this piece as a faux martial-arts sequence. However, the abstract nature of the choreographer, Carmichael’s, intentions needed to be appreciated, more as a series of “complex interactions” (as per the synopsis), which the audience was able to do. Hayley Raw in “No, I Would Never” exhibited great skill in timing and mime. There was an audio clip which she responded to that conveyed first response reactions to social dilemmas, so, it payed the audience to watch and listen carefully to sometimes embarrassing and shocking confessions. Raw did respond to the contentious material in dance form, so successfully engaged the audience. The co-winner of the Outstanding Female Dancer Award, Rosslyn Wythes, gave us her best work in “/LU:P/”. She reminded us all that we are on a loop of sorts; that our lives speed up and that we are caught in a cycle. Wythes was precise, connected her task and fully integrated into the dance space that she created through her use of form and movement. The People’s Choice Award went to “Swingdancin’”- an energetic, fun-filled razamatazz sequence choreographed by Natasha Crane. 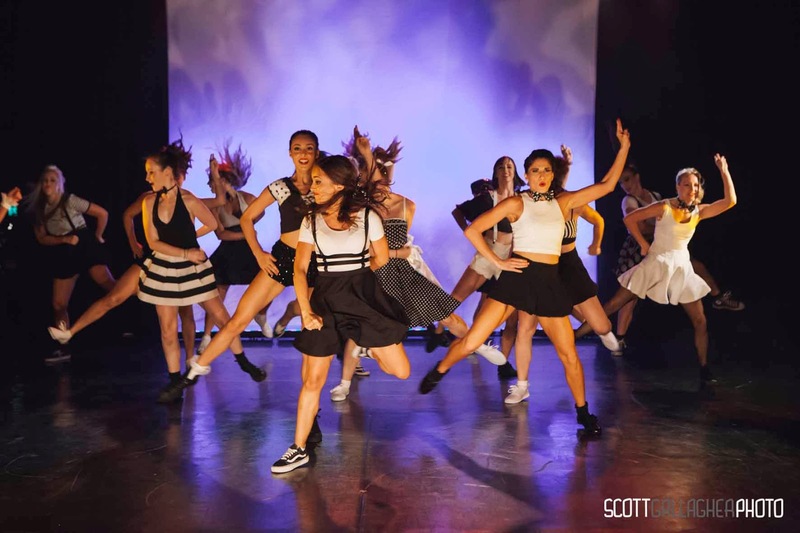 The audience responded to the infectious nature of the upbeat music, quirky dance moves and the in-tune highly synchronised, deftly skilled dance troop. This was just a real pleasure to watch; the costumes (all variations of black and white), the solo performers and the smaller group interludes were interspersed with trained footwork, acrobatics and complementary hand gestures. This uplifted the audience and made everyone glad that they’d come out on a Sunday night to enjoy the Short and Sweet Gala Presentation.